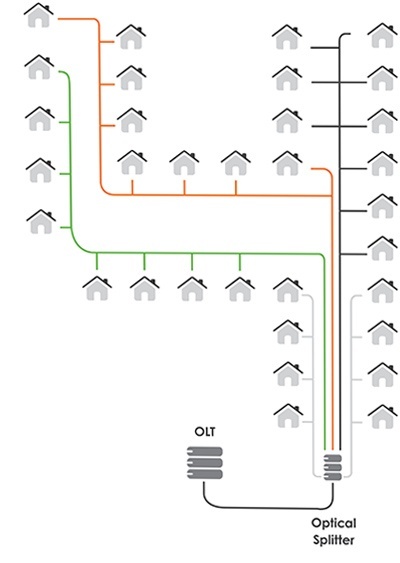 When deciding the best fiber architecture for their network, planners have to make the choice between point to point (P2P) or a passive optical network (PON). Both have strengths and weaknesses, as we covered in a previous blog. The majority of network operators have invested in GPON and GEPON architectures. However, since they’ve been installed, predicted bandwidth needs have increased dramatically, meaning that they now need to change. Consequently, much work has been done in creating a successor to GPON and GEPON, ensuring that PON architectures are able to underpin future, higher capacity networks. After a false start along the way, the new NGPON2 standard, created by the FSAN group, looks set to achieve this. Before discussing NGPON2 and what it delivers, let’s look at the current picture. At the moment GPON provides 2.5 Gb/s downstream and up to 1.25 Gb/s upstream capacity. This is shared between 32 or 64 users (depending on the splitter options used). Basic maths shows that, even with dynamic bandwidth allocation, such systems struggle with providing 100 Mb/s service and certainly cannot cope with Gb/s rates at all. In comparison, P2P systems have always coped with 100 Mb/s to 1 Gb/s transmission (usually symmetrically), but are more costly, due to the number of components involved and the fact they require a greater number of street cabinets. Given that many operators are looking at gigabit broadband speeds to individual users, clearly GPON is not a sustainable solution for many of them. They could, of course, switch to P2P to meet these needs. However, given that rolling out PON networks is intrinsically less expensive than P2P and the extensive, existing investment in PON architectures, the industry has been working on next generation (NG) PON standards over the last five years. They are now ready for deployment, with equipment available from major manufacturers. The first next generation PON standard (variously known as XGPON or NGPON1) delivered performance that was at least four times better than GPON. It provided for 10 Gb/s downstream and a range of upstream speeds including the possibility of 10Gb/s. However, NGPON1 struggled to get customer buy-in as it required operators to buy completely new equipment for only a four-fold ultimate capacity benefit. Like GPON, it relied on time division multiplexing (TDM) technology, which allocates time slots on an optical signal to individual users. • There is a limit to the number of time slots that can be practically created (and most users feel this limit is approaching). • The network owner has to make a significant upfront investment into a system that has potentially nowhere else to go. Consequently, operators shied away from NGPON1 and worked on combining different service levels that enabled them to "make do" with GPON (or GEPON) without any further investment. However, operators (and equipment manufacturers) understand that you can only make do for a short amount of time. New networks being planned now have to operate effectively and deliver the required bandwidth well into the future, so a viable upgrade path from PON is vital. The solution, NGPON2, is actually relatively simple. Essentially, it involves stacking multiple NGPON1 systems on a fiber network, using time and wavelength division multiplexing (TWDM) techniques to ensure they work together. This combines multiple signals onto a single optical fiber by using the different wavelengths (i.e. colours) of laser light, and then splits transmission into time slots, in order to further increase capacity. 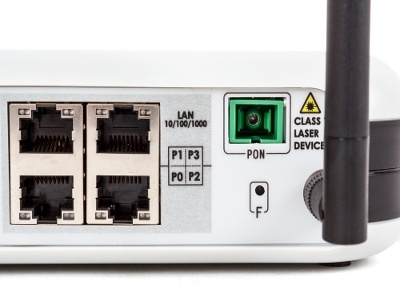 Firstly, it can co-exist with existing GPON and NGPON1 systems and is able to use existing PON-capable outside plant. Since the cost of PON FTTH roll out is 70 per cent accounted for by the optical distribution network (ODN), this is significant. Operators have a clear upgrade path from where they are now, until well into the future. Initially NGPON2 will provide a minimum of 40 Gb/s downstream capacity, produced by four 10 Gb/s signals on different wavelengths in the O-band multiplexed together in the central office with a 10 Gb/s total upstream capacity. This capability can be doubled to provide 80 Gb/s downstream and 20 Gb/s upstream in the "extended" NGPON2. Both the basic and extended implementations are designed to appeal to domestic consumers where gigabit downstream speeds may be needed but more modest upstream needs prevail. For business users with data mirroring and similar requirements, a symmetric implementation will be provided giving 40/40 and 80/80 Gb/s capacity respectively. Both the leading FTTH active equipment providers, Alcatel-Lucent and Huawei Technologies, are promoting NGPON2 for deployment in 2015. Operators are now looking at NGPON2, both for new networks and for replacing existing PON equipment in areas with potentially high capacity needs. Of course, now that the issue of delivering gigabit bandwidth to individual subscribers has potentially been solved, the focus is turning to increasing capacity in the backhaul network. To find out more about developments in this area take a look at this previous post on multicore networks.